6050m2 Single Storey laundry facility (offices- 2 storey) containing a production area sub divided into various specialist wash rooms, clean room and dispatch and storage areas. These areas included a Matt washroom, CRT washroom, Hospitality section, Healthcare washroom section and a Healthcare clean room section with clean room prep area and sterile dispatch area. To meet HSE regulations a clean room environment had to be maintained to avoid cross contamination from other areas of the building. There is a separate main entrance with adjoining canteen, kitchen, toilets, changing areas with a stairs and lift the first floor offices. The construction of the laundry facility was carried out in close proximity to live office buildings, residential areas and busy roads. 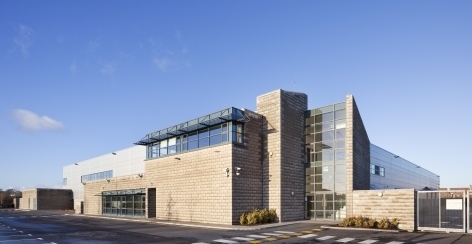 The site development was complex due to the extensive rock outcrop and underground springs coupled with requirements for deep process pits and under floor ducted services. The presence of water during the excavation process also made to completion of the ground works more difficult. The site was excavated fully (14000 cubic metres approx.) to remove poor material and filled to reduced levels with lean mix concrete to allow formation of pad foundations for the steel frame. 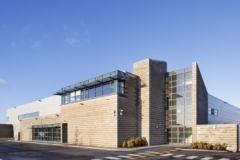 JSL also completed a refurbishment works contract (€1.5m) in Jan ’08 to April ‘08 following fire damage in Nov ‘07 -demolition & reconstruction of approx. 2000m2 of the overall 6000m2 of the existing operational linen cleaning facility involving a great deal of pre-planning and co-ordination with the client and facility staff as the facility remained in full use on both sides of the fire affected area. Architect & Design Team: Architects: Kieran Barry & Associates, River Road, Blanchardstown, Dublin 15; Engineer (Struct): Desmond & Associates, The Captains Cabin, 68 Lower O’Connell St., Kinsale, Co. Cork; Engineer (Services): Bespoke Engineering 14 Brighton Gardens, Rathgar, Dublin 6.